It is safe to say that the low production numbers for Puerto Rico quarters were a source of conversation for those in the industry a couple of months back. For those who were surprised at those historically low levels, they will be shocked to hear of the drop in production for the Guam quarter. And needless to say, the latest US Mint Guam sales figures show demand for the quarters during their first week of sales in bags and rolls is stronger than that experienced by the Puerto Rico quarters. Figures from the US Mint released Tuesday show that only 87,600,000 Guam quarters were produced, with 45 million of those struck in Philadelphia and 42.6 million at Denver. That accounts for only a bit over 63% of what was issued for the Puerto Rico quarters. More staggering is the comparison to the District of Columbia quarters issued the first part of this year. 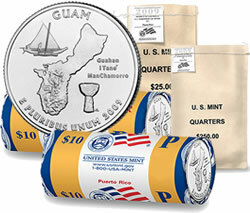 The total mintage for the Guam quarters only adds up to about 50% of what was produced for those DC quarters. What is the biggest factor behind the drop? As previously discussed here, the recession has increased the amount of coinage in circulation as people are spending their change instead of hoarding it at home. Consequently, banks are not requesting new coins. "The Guam issue could make the current frenzy over the Birthplace Lincoln cent look like the appetizer before the speculative banquet." His prediction could be right. Finding any of DC or Puerto Rico quarters in circulation is extremely difficult. With the lower mintage of the Guam quarters, they are likely to be even harder to find. Undoubtedly now that the production figures have been released, the US Mint will be inundated with even more orders for bags of the Guam quarters and the two-roll sets from collectors. They will want to insure they are able to get their hands on some. Speaking of those bags and quarters, here are the latest US Mint sales figures from their launch on Tuesday, May 26, through to Sunday, May 31. Perhaps it is not too late to book a flight to Guam for the release ceremony on June 4 at Skinner Plaza in Hagåtña. Remember, you will be able to exchange your currency for rolls of the quarters. Take your kids along too, they will get a free Guam quarter just for attending! I just found your site, its very good info.and in my favorites. The Guam quarters should sky rocket because of the very limited production. I remember in early 2000 when the frenzy over Delaware Pennsylvania & New Jersey quarters drove the roll prices into the $50.00 range per roll, if all things are equal, Guam should be a good investment at least in the short run. Supply and Demand will be in operation here. Basically a little more than 1,000,000 rolls both for Denver & Philly. I would try and get some at your local bank if they have them, and put them away and see what happens to the pricing on them.